Social Media is arguably one of the most important marketing tools in online advertising, with nearly 92 percent of marketers attributing the success of their campaigns to social strategies in 2014. Despite obvious benefits, however, many apartment management companies are reluctant to include social media strategies in their marketing plans. Whether due to a lack of resources or fear of a brand-tarnishing post, these companies have refrained from using social channels, a decision which could potentially cost countless leads and lease signings. Fortunately for companies late to the social media game, our revamped social post services deliver quality postings at an affordable price point. But before we get into the finer details, let's take a closer look at some of the challenges apartment management companies face when running social campaigns, as well as some of the benefits that can be gained when you follow consistent and effective strategies. Resource management is the first reason companies avoid putting too much effort into social media marketing. Although it's true that property management companies can set up profiles across various networks and post to these networks free of charge, this process requires a human element, especially if your company manages multiple properties and desires to update social pages several times each week. In order to wage an effective campaign across various social channels, you either have to pull resources from other projects or consider making a new hire to run social profiles for all properties. While resource management presents a challenge, the prospect of a brand-tarnishing post is an even more frightening hurdle that companies risk leaping by introducing a social media strategy. It seems as though offensive tweets from untrained interns make the headlines almost monthly these days, and all too often recovering from these mistakes just isn't possible. By avoiding social media entirely, apartment companies reduce their chances of dealing with a reputation crisis. Admittedly, multifamily companies are wise to consider the scenarios mentioned above when thinking about social media marketing for apartment communities. But it's also fairly clear that the benefits of social media far outweigh the cons. First off, according to a study by Texas Tech University, companies that actively engage audiences on social media enjoy higher brand loyalty than companies that do not engage their fan base. By actively updating social channels for your properties, you open a line of communication that humanizes your community among current residents and encourages renewal rates. A consistent social media presence will catch the eyes of potential new renters, as well. On a related note, the open line of communication we just mentioned also helps you make improvements that you may have otherwise overlooked, via current renter's recommendations about certain features of the community. While you obviously can't bend to every recommendation or request, it's more than likely you'll come across a few ideas that you can easily accomodate. If a handful of residents recommend creating a community volleyball or tennis league, for example, you can organize games and foster an environment that residents will want to continue enjoying. Furthermore, sharing information about certain things going on in the greater region will help you gain exposure to a larger audience. 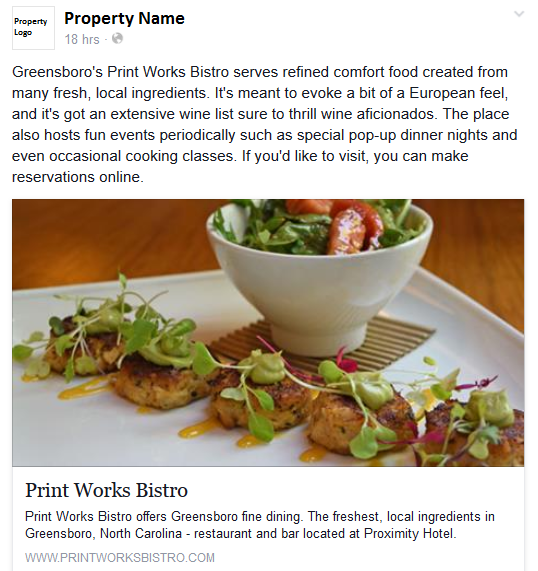 If you share a story about a new local restaurant opening, for example, it's quite likely that the restaurant will respond by promoting your community in turn. Not only do you get to inform your residents about something they might potentially enjoy, you also benefit from your community being exposed to the restaurant's fans, completely free of charge to you. The newest social post services from Respage eliminate the challenges of social media marketing while simultaneously embracing all the benefits. Colorful and informative, these professionally written posts encourage conversations without pulling resources from your in-house team. Social posts are included in our Socialite, Hipster, and Super Nerd packages, and we're happy to report that current clients are witnessing great success in terms of the number of likes, shares, and retweets each post receives. If you're looking to renew your multifamily company's approach to social media, contact one of our representatives to see what Respage can do for you.